Doctors in India were stunned to remove a tapeworm measuring more than 6 feet through a patient's mouth, according to a report published this week in the New England Journal of Medicine. Dr. Cyriac Phillips wrote in an email that the 48-year-old man underwent a colonoscopy in 2014 after complaints of "tolerable" abdominal pain that had gone on for two months and test results indicating low hemoglobin concentrations in his blood. While performing the colonoscopy, Phillips discovered part of the worm. "It was an undulating, moving piece of the worm, " he said, "This worm segment was confirmation that there was a tapeworm infestation in this patient." After the initial discovery, doctors performed an endoscopy, a procedure using a camera inserted into the patient's stomach to view the intestines. During the procedure, Phillips and his team were able to see images of the lengthy parasite residing in the small intestine. After sedating the man, a team of physicians at the Institute of Liver and Biliary Sciences Hospital in New Delhi was able to extract the worm by pulling it through his mouth with a pair of forceps. When removed, the tapeworm measured 6.1 feet and was classified as a Taenia solium, otherwise known as a pork tapeworm. According to the Centers for Disease Control and Prevention, a fully grown adult worm typically measures between 2 and 7 meters (6.5 to 23 feet) in length, but there have been cases reporting worms more than 8 meters (26 feet) long. 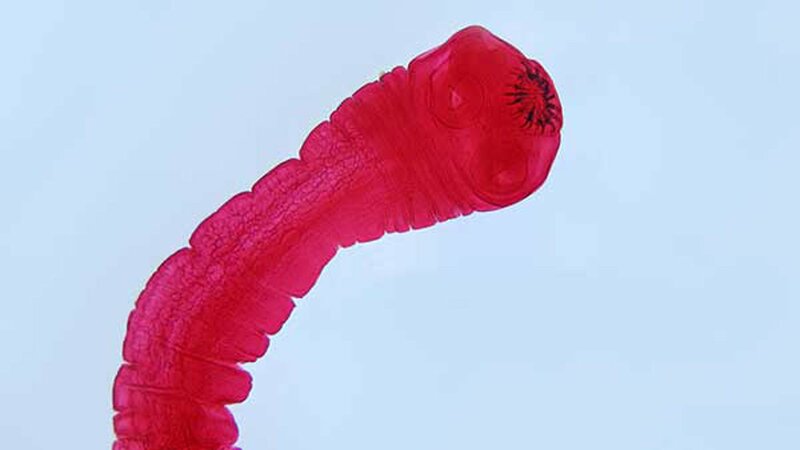 "We had absolutely no idea regarding the length of this worm," Phillips said. "It kept on coming. "We pulled at it softly and steadily, and ultimately the job was done after maybe around 1 hour and 15 minutes. I have never seen a tapeworm this long before this particular case." After the procedure, doctors prescribed praziquantel, a medication used to treat parasitic worm infections, to kill any eggs or larvae potentially remaining in the man's intestines. Doctors advised the patient and his family to take deworming medication for the next six months. Phillips also warned about potential food contamination, suggesting the man avoid places with poor sanitation and "to cook pork well at home before consumption." Pork tapeworm infections, medically diagnosed as cysticercosis, are contracted by ingesting tapeworm eggs. These eggs can then spread through contaminated food and drinking water as well as surfaces with contaminated feces.